ABOUT: Developing countries neither have the resources nor the inclination to provide security of health, education and minimum living expenses to each citizen. ABOUT: Developing countries neither have the resources nor the inclination to provide security of health, education and minimum living expenses to each citizen. Hence, search for wellbeing has been one of the biggest reasons for migration from least developed countries to developed countries. But with India gaining strength, both economically and geo-politically, perhaps it's time to give every Indian a social security net. Reetika Khera, Associate Professor, Humanities and Social Sciences Department, IIT-Delhi, outlines how we can achieve the goal of 100 per cent social security. In November 2004, when the National Rural Employment Guarantee Act (NREGA) was being debated, one commentator remarked that the draft had "entered national policy debates like a wet dog at a glamorous party." As I sat down to write for Business Today's glamorous end-of-the-year issue, I felt a lot like that wet dog. The reason is this - much more than before, public discourse in the mainstream, especially business, media has become hostile to social policy. Social policy, in this context, includes health, education, social security and related issues such as right to work and right to food. Here are my four wet dog wishes. 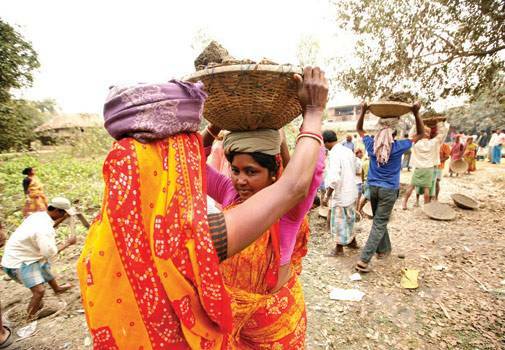 Since 2005, the right to work is partially guaranteed by NREGA. The Right to Education (RTE) Act made elementary education a legal right in 2009. In 2013, the passage of the National Food Security Act (NFSA) was a step towards ensuring the right to food. The NFSA is not just about selling subsidised grain through the Public Distribution System (PDS). One of its main contributions is the recognition of maternity entitlements for all women. It is another matter that it provides only `6,000 per child, and even that the government has made little effort to operationalise. The NFSA also upholds food entitlements under the Integrated Child Development Services (ICDS) Scheme for children under six years and the Mid-Day Meal (MDM) scheme for school-going children. The framework for legal entitlements is clearly laid out in the preamble to the Constitution, which aspires to achieve social, political and economic justice and to guarantee equality of status and opportunity. In recent times, there appears to be a widespread perception in the mainstream media that India has gone overboard in creating legal safeguards for socio-economic rights. In one speech, the prime minister reportedly said that we needed "action not Acts" (as if Acts pre-empt action). Is India unique in enacting laws to guarantee its citizens basic rights such as education, food and employment? The evidence suggests otherwise. Apart from the richer European countries, which have extensive legal provisions for such rights (including the right to health, non-existent in India), even among the BRICS countries there is plenty of legal protection. The post-dictatorship Brazilian Constitution from the 1980s and the post-apartheid South African Constitution from the early 1990s aspire to more expansive safeguards, which have been gradually realised over time. For instance, in South Africa, these rights are for all residents, not just citizens. In India, critics of socio-economic legislations routinely use derogatory terms ("doles", "freebies", "handouts") to describe them. In fact, the "right" perspective on these programmes is the "rights" perspective. Important gaps remain. Social security pensions and community kitchens, which were part of the draft NFSA, were ultimately dropped. The coverage of social security pension for widows, elderly and people with disabilities remains abysmally inadequate. Pensions sound grand, so it is worth reminding readers that the central government pays `200-300 per month as pension under these schemes (some, not all, states have topped up these amounts, bringing them up to `1,000 per month). The woeful state of health facilities is the biggest gap in India's welfare architecture. Health care in India needs urgent attention, before things go the way they have in the United States of America (USA) - one fact that does not get adequate attention is that the US achieves poorer health outcomes at higher levels of per capita spending. This is primarily due to the widespread presence of private insurance (which drives up costs). Once private corporate interests are entrenched, it is difficult to reverse that model. In spite of the shortcomings of the social welfare system - both in terms of the flaws in existing laws and the gaps in the legal framework - research shows that these interventions do add up to something for disadvantaged groups. What is also clear by now is that cash transfers (such as pensions or maternity entitlements) and in-kind transfers (school meals, community kitchens and subsidised ration) need to be seen as complements rather than substitutes. We must not be close-fisted about public spending on existing social security programmes. This expenditure must be viewed as an investment in our most abundant asset - people. In spite of the shortcomings of the social welfare system - both in terms of the fl aws in existing laws and the gaps in the legal framework - research shows that these interventions do add up to something for disadvantaged groups. A recent misconception is that India is spending too much on social welfare, creating a nanny state for the poor. In fact, India is a social under-spender. As economist Jean Dreze pointed out last year, India is among the "world champions" as far as social under-spending is concerned. 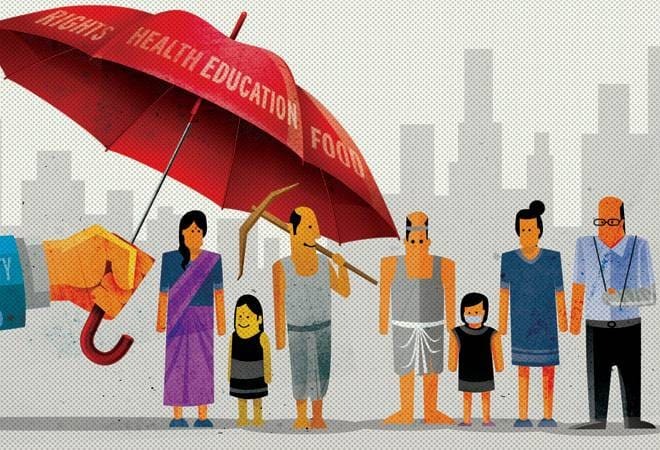 Public spending on health and education in India is less than 5 per cent of GDP - lower than in Nepal, Sub-Saharan Africa and the least developed countries, the figures for all of which are 6-7 per cent of GDP. As if things were not bad enough, the last Budget announced drastic cuts - the budget for the Integrated Child Development Services (ICDS) Scheme was initially halved (in August, extra funds were made available, but even that took it to about two-thirds of the previous year's budget). The hugely popular and successful Mid-Day Meal (MDM) Scheme faced a drastic reduction (from Rs 13,215 crore to Rs 8,900 crore). Increased devolution of tax revenues to the states is unlikely to compensate for these brutal cuts. Another line of defence is that we do not have the "fiscal space" to do so. The budget numbers, however, do not corroborate this impression. Compared with 0.3 per cent and 1.5 per cent of GDP that is spent on NREGA and NFSA, respectively, military spending in India is 2.4 per cent of GDP. Tax breaks amount to about 3 per cent of GDP. There is some fiscal space, but it is being utilised only very partially on social welfare. Of course, some of these tax breaks encourage investment or industry. Others are definitely questionable. For example, the tax relief to the gold and diamond industry (around Rs 60,000 crore) is twice as much as the expenditure on NREGA (approximately Rs 30,000 crore). It is thrice as high as exemptions to the textile industry, which is estimated to employ 45 million people (as opposed to about three million that work in the gems and jewellery industry). Another aspect of the affordability argument is tax revenue. If tax revenues were more buoyant, that would also create more fiscal space. According to research by Piketty and Qian (2007), between 1986 and 2008, in China the proportion of the population that pays income tax increased from less than 0.1 per cent to about 20 per cent (later, it declined to 8 per cent). India has been stuck at 2-3 per cent. It is nobody's case that there is no corruption in the implementation of these programmes or that we can condone it. However, the correct response to corruption, whether it is NREGA or NFSA or whether it 3G and coal scams, is to find ways of fighting back. It is somewhat worrying that as the country gets richer, instead of widening the scope and scale of social security, there has been an attempt to pass off contributory insurance and pension schemes as social security. This attempted rebranding and restriction of India's welfare system from its correct interpretation, which includes education, health and social security, seems to be in line with the recent unreasoned and unrelenting attack on social welfare. It is nobody's case that there is no corruption in the implementation of these programmes or that we can condone it. However, the correct response to corruption, whether it is NREGA or NFSA or whether it 3G and coal scams, is to find ways of fighting back. Much has been learnt on how to do that - at least in the case of NREGA and the PDS - over the past few years. Sadly, the rhetoric has acquired a life of its own ("only 15 paise out of one rupee reaches the poor"), very often out of sync with facts. What is the actual situation? As far as the PDS is concerned, several independent studies show that there has been an improvement on the leakages front: according to our own estimates using the National Sample Survey data, "leakages" have gone down from over 50 per cent (in 2004/05) to around 40 per cent (in 2011/12). Several other studies (including the India Human Development Survey, Delhi School of Economics, World Bank, etc) also document this improvement. The leakages were still high in 2011/12, but there is evidence of continued improvement in recent years, and every reason to hope that they can be reduced further. The decline has been more dramatic in states that have implemented the NFSA. NREGA, too, has seen a reduction in corruption levels: the mismatch between government records and self-reported employment in 2011/12 was 5-32 per cent (depending on the data source), down from around 50 per cent in 2007/08. Disregarding evidence, influential commentators and think-tanks continue to fall back on studies that are ten years out of date, creating the impression that nothing has changed. In case of the PDS, a 2005 Planning Commission study (which was based on data for 1997-2001) continues to be cited for leakage estimates, even though more recent estimates are available. Most recently, a government committee, with the help of creative accounting, managed to show an increase in leakages. Even after the authors admitted to the erroneous calculations, some sections of the mainstream media continue to cite these estimates. Using old statistical tricks (such as reporting only absolute levels of spending), the media helps create a distorted impression of social spending. For instance, NREGA and NFSA receive a lot of attention as high expenditure items. One financial paper ran a headline "Can We Afford Rs 6 lakh crore food subsidy in 3 years? ", instead of presenting the figure on an annual basis or as a percentage of GDP (the NFSA is 1.5 per cent of GDP). Many of those who question these programmes often do so on the basis of timeless anecdotes ("in my village, PDS grain is of poor quality"). Interestingly, these same commentators ignore the wealth of rigorous evidence that presents a more balanced picture to accuse others of being ideologically driven! The debate around NREGA assets is an apt example of this, where the derogatory remark by the prime minister in Parliament is at odds with the evidence. Yes, NREGA roads need regular repairs, but so do the roads in our cities. Compared with 0.3% and 1.5 % of GDP that is spent on NREGA and NFSA, respectively, military spending in India is 2.4 per cent of GDP. Politicians and media are not the only sources of misinformation. Oddly, the Comptroller and Auditor General (CAG) seems to have joined the party. Its recent report on the MDM scheme betrays how it is innocently ignorant of the wealth of rigorous research in economics documenting the benefits of MDM on enrolment, attendance, nutrition and learning effort. Similarly, its report on procurement claimed a loss of thousands of crores to the government because it allows private millers to keep valuable paddy by-products. It fails to mention that this is standard practice (millers keep the by-products when they mill for private entities). Some media outlets unquestioningly reproduced the CAG's presumptive losses. Social media allows us to remedy some of the undemocratic practices of mainstream media, politicians and others - many more of us should use this democratising development.